-US Dollar rally growing long in tooth, say TD Securites. -Now a good time to "fade" recent moves and sell Dollar index. -Also good to sell the USD/JPY rate as it offers 4% downside in June. The US Dollar ascendency seen in the second-quarter has gone as far as it is likely to, according to strategists at TD Securities, who argue it now makes sense for traders to "fade" the recent rally and bet on a decline in the Dollar index over coming weeks. TD Securities' call comes as the US Dollar index appears to have stalled ahead of the 94.0 level, following an eight week long rally that saw the greenback convert a 4% 2018 loss into a 1.7% gain. It also echoes similar sentiments expressed by analysts at Morgan Stanley, who correctly called the nascent US Dollar trend back in March, suggesting a potentially broader shift in opinion within the analyst community. "We see oil as nearing a peak on any near-term horizon," says Mark McCormick, North American head of FX strategy at TD Securities. "Given rising oil prices have been pressuring real yields higher, curves flatter, and the USD higher, this anchors our view for starting to fade some of these moves." Above: US Dollar index in 2018. Captures April and May rally. Driving recent moves in exchange rates has been a sudden shift in global bond markets, which has seen yields on American bonds of all tenures rise to multi-year highs which, when compared with interest returns offered by bonds denominated in other currencies, has seen interest rate differentials favouring the Dollar move to near record levels. 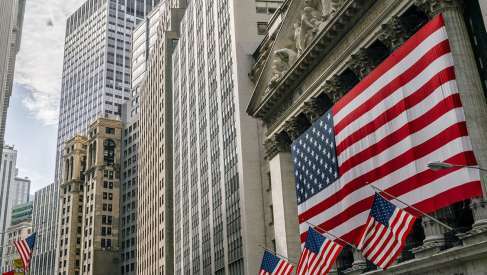 Multiple factors have been behind this shift, including an inflation-boosting rise in oil prices, superior levels of US economic growth and rising issuance of new bonds at the US Treasury in order to finance President Trump's budget-busting tax cuts. Nonetheless, more favourable "yield spreads" have seen international investors, particularly so called carry traders, incentivised to sell lower yielding currencies and buy the Dollar in order to invest in the US bond market. The TD Securities FX team argue Friday this trend could now be about to go into reverse. Above: 10 Year US Government Bond Yield. There have also been other drivers behind the greenback's resurgence, notably, a reversal in the speculative positioning of traders. Up until April traders had been betting heavily against the US Dollar, so much so that the value of "net shorts" had risen to a multi-year high, as conventional thought dicated that a broad-based upturn in the global economy would mean there were more attractive returns to be had elsewhere. The US Dollar typically has a negative correlation with momentum in the global economy. "The easier phase of being long risk in this cycle has likely passed, but exceptional central bank policy in part helped sustain a build up that required working its way out of equities, credit, the dollar, and now emerging markets. For example, our CTA model for the USD was flagging 100% short USD just six weeks ago. Closing out those shorts, rather than any significant long-term positioning for USD strength, has driven the severity of the recent USD moves," McCormick explains. Crucially for the Dollar, data trickling in throughout the April month made clear that global growth slowed markedly during the first-quarter of 2018, which prompted a broad wave of "position squaring" by traders. This position squaring required traders who had previously sold the Dollar short, to buy it back in order to exit their bets, compounding the bond market effect on the greenback. However, with global growth expected to pick back up, oil prices seen topping out during the summer, US inflation pressures viewed as "transitory" and the Federal Reserve suggesting it is in no hurry to pick up the pace at which it raises US interest rates, there are few reasons for thinking the US yield surge and Dollar rally can continue beyond the very short term. 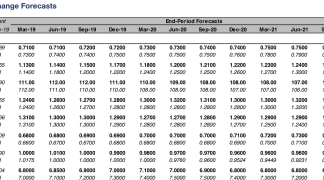 "We are starting to look for opportunities to reverse recent FX trends now, starting with selling USDJPY, and suspect the conditions will materialize to get long EURUSD by the end of June," McCormick concludes. 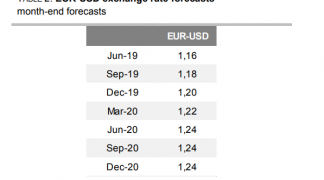 The Euro-to-Dollar rate has fallen from grace in recent weeks, much like all other US Dollar facing currency pairs, reversing a 4% 2018 gain to trade down at around a 1.7% loss near the 1.1700 handle. The Euro's losses have been compounded by a recent turn-for-the-worst in Eurozone politics, which threatens to bring a so called Eurosceptic government to power in crisis-hit Italy, but despite this many analysts remain optimistic in their currency forecasts for year-end, suggesting the pair can potentially reach as high as 1.30 over the next six months. 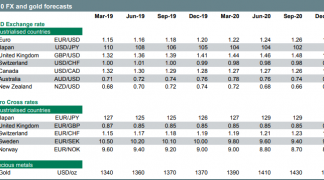 This complex economic, political and market environment prompted TD Securities to recommend Thursday that clients sell the USD/JPY exchange rate at 109.50, with a stop-loss at 112.10, targeting a move down to 105 over the next month. They also suggested Friday that clients can benefit from an attractive risk-reward ratio if they sell the US Dollar index around 94.0 level. "Against this backdrop, and with USDJPY rekindling its romance with 10yr USTs, we expect the pair to exhibit the first signs of USD fatigue. Trade rhetoric and geopolitical tensions have also intensified, while the situation in Italy - though overblown in our view - remains fluid. This is not a conducive backdrop for risk," McCormick wrote. The US Dollar index was quoted 0.17% higher at 93.93 during the morning session in London Friday while the USD/JPY rate was 0.09% higher at 109.41 after having fallen sharply on Thursday. The Pound-to-Dollar rate was 0.35% lower at 1.3334 and the Euro-to-Dollar rate was 0.23% lower at 1.1694.